Video: Bobbie Wygant Interviews Cheech and Chong for "Nice Dreams"
Here's an interview with Cheech and Chong and Evelyn Guerrero from 1981. They are promoting Nice Dreams. Bobbie Wygant Interviews Cheech and Chong for "Nice Dreams" from Atombomb.tv on Vimeo. To thank all the farrrr out Cheech and Chong fans for another great year with another great comedy tour, all Cheech and Chong shirts are now $15. Plus, worldwide shipping on everything on this web site is FREE. Tickets start at $29 and go on sale January 8th at 12PM local time via the Ticketmaster link above. Showtime has announced that it has renewed critically acclaimed comedy series THE GREEN ROOM WITH PAUL PROVENZA to air in 2011. Some of the nation’s top comics, including Ray Romano, Kathy Griffin, Margaret Cho, Tommy Chong, Lewis Black, Ron White, Joe Rogan, along with blockbuster comedy writer/director/producer Judd Apatow (The 40-Year-Old Virgin, Superbad) have signed on for the six-episode second season, which will be shot in January. The series offers viewers a rare, fly-on-the-wall look at comic legends, raw and uncensored in a spontaneous, intimate, roundtable setting with comedian Paul Provenza (director and co-producer of The Aristocrats) serving as moderator and executive producer. Barabara Romen is also an executive producer, and Kelly Carlin, daughter of famed comedian Geroge Carlin, is joining the show this season as a producer. Today is the last day to place your order for Christmas delivery. Free worldwide shipping! Shipping will be refunded after your order ships. Free shirt with every order of $75 or more. All shirts are buy one, get one. Just put the shirt you want free in the notes during the checkout process. Offer expires Monday, December 20th at 12AM New York. As a goof (a la Kanye West), Tommy Chong interrupted actress Anna Faris who won “Stonette of the Year” back in 2007 for her performance in Smiley Face. Cheech Marin & Tommy Chong sit down with Martini Beerman of Rock.com at the recent Gibson Guitar signing on the Sunset Strip. 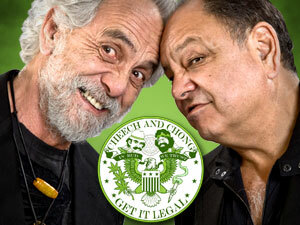 They discuss everything from their reunion, to their tour and Chong's incarceration. In what would be be his first comedy series gig in almost 20 years, Cheech Marin is set to co-star on Fox's half-hour pilot Outnumbered. "Larry wrote a fantastic script," said MRC TV topper Keith Samples. "Everything fell into place; it had a karmic feel to it. Kevin loved the original and loved what Larry did with the adaptation." An unbroadcast pilot has been made and further scripts have been written. The pilot will be broadcast, but a date has yet to be given. We have tons of stuff for sale in our ebay auctions taking place right now. Super discounted prices and free domestic shipping. From now until December 20th, there's no worldwide shipping and handling on anything plus you get a free shirt with every order of $75 or more. We also have ebay auctions taking place right now. Super discounted prices and free domestic shipping. Here is video of the NY Post speaking to Cheech Marin, Howard Stern and more about the Quentin Tarantino Friar's Club roast. Cheech Marin, as well as some A-list celebrities such as Howard Stern, attended the Friar's Roast of Quentin Tarantino this evening at the Hilton in New York City. There were 2,270 guest, a Friar's Club attendance record. 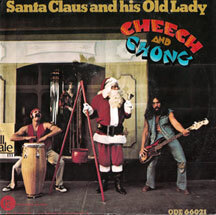 In this interview, Cheech says the Eli Roth and Quentin told him Cheech and Chong records and films inspired scenes in their films. All prints are available now exclusively on the RockPoP Gallery website – please visit http://rockpopgallery.com/items/ernie-cefalu-pe-e/list.htm for complete details. About RockPoP Gallery – An online fine art gallery based in Portland, OR, RockPoP Gallery is dedicated to bringing customers the best selection of limited-edition, rock and pop music-related art prints, photography and related collectibles available on the market today. With a focus on album cover artwork, our Gallery collection features over 650 examples of artwork, illustrations, photographs, illustrated lyric sheets and sculptures from the leading artists in their respective fields. RockPoP Gallery was founded in 2005 by Michael Goldstein, a former television and interactive programming development, creative and production executive and long-time collector of music-related artwork. Since that time, RockPoP Gallery has helped music fans and collectors worldwide buy copies of some of the most cherished images from the last 40 years of rock n’ roll albums, CDs, promotional materials, concert photography and other imagery, allowing these customers to decorate their homes, apartments, and workplaces with the highest-quality products at highly-competitive prices. RockPoP relocated from Long Island, NY to Portland, OR in September, 2008.